The insurance industry at its heart is powered by a deep investment in IT. This investment makes it possible for insurers to support their customers and help them recover from losses ranging from minor automotive fender benders to devastating events caused by fire or weather. At the core of this investment should like a reliable and efficient operating system. 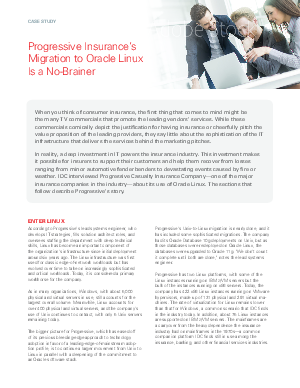 This IDC report looks at how Progressive Casualty Insurance Company has utilised Oracle Linux as an integral component of its IT infrastructure and explores the benefits they’ve gleaned from it.